I’m hollow-eyed and bleary today, and I haven’t had enough coffee. A little later I’ll be pootling round York, picking up travel essentials and converting my Brit money into Euros before jetting off to Austria tomorrow afternoon. Tomorrow will be my second visit to London in 3 days, and yet again I’m using the train. If you know what rail prices in this country are like, you might now be wincing. Yes, there are smart, effective ways to whittle your train fares down to something vaguely affordable, but even with forethought, research and expert haggling over the phone, there’s only so much you can do. And frankly, the amount you have to plan ahead is…irksome. I’ve taken the train from York to London, almost always exactly the same service, for prices ranging from £12 to £88, one-way (with returns anything from £28 to £infinity). It’s a fickle, wearisome mess. Yesterday, partly by bus and partly by train, I got to London and back for £10. 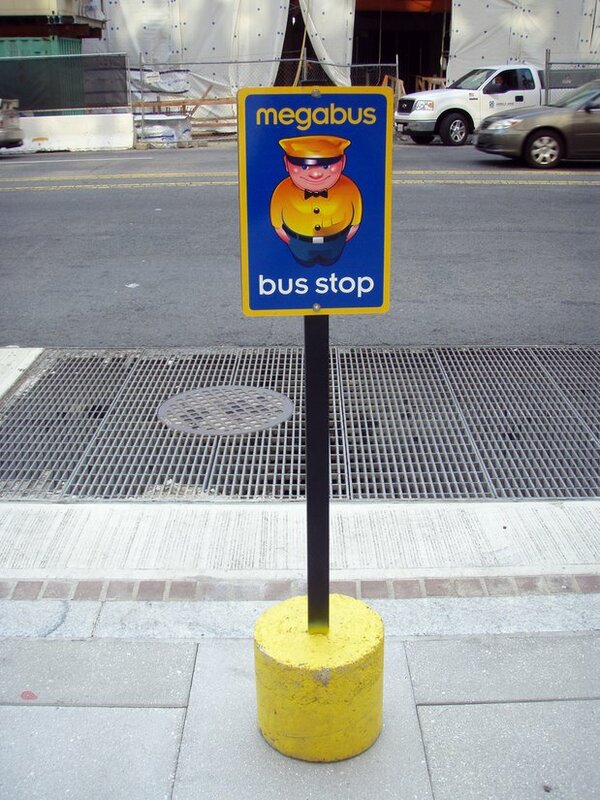 Name: Megabus UK / MegabusPlus. Nature of service: a yield management fare bus service / ….bus and train service. Routes: 20+, the majority windmilling out from London, the rest connecting major cities by way of minor ones. A gentleman (let’s call him ‘Chim) wishes to get from York to London on Monday the 11th of July. He’s on a limited budget (who isn’t? Apart from really rich people, and hey, who cares about those jerks? Apart from other rich people? Well, I digress). He decides to travel as soon as possible after 6am. Single ticket prices: 6am-8am tickets = £83 (ouch)…8.20am ticket = £65…the 9.29am to 11.29am tickets are down to £44…and 2.01pm we have a winner, at £22. All the same journey, wildly different prices – madness. But at least that’s a fairly pain-free price. (If ‘Chim had booked weeks ago, it could be a lot lower). And the story could easily end there. However, ‘Chim knows about Megabus. Book more in advance, as I did for my tickets yesterday, and the price drops to £5. The brilliant airline aggregator Hipmunk allows you to sort your flight options by “agony” – the duration and the stop-overs combining to fray your sanity and numb your posterior. It’s this principle that needs to be uppermost in your mind when using Megabus. By Trainline-booked train, your £22 journey will last a little over 2 hours. By using Megabus, that journey is double the duration – in fact, coming back from London last night took a total of 5.5 hours. How much agony are you willing to put up with? Let’s say you’re lucky enough to get one of the £1 (yes, £1) tickets available way in advance for a journey from London to Edinburgh? Are you willing to sit on a bus for 9 hours to save yourself roughly £50? Decide this in advance. No, really. The other thing about Megabus is its regularity – which is far less than standard train services. York to London? Twenty or thirty trains a day. Megabus? Two services. Miss them, and you’re stuffed. Megabus UK and MegabusPlus are stupendously affordable ways to get around the UK, particularly if your first port of call is London. Using them can save you a ton of money. But they can be agony. Decide how tough you are, and weigh that up against how tight your budget is. Images: Mike Sowden and Daquella manera.